SHIRT IS BRAND NEW AND MADE TO ORDER IN A VARIETY OF SIZES AND COLORS. CHOOSE IN THE DROP DOWN BAR YOUR SIZE AND COLOR PREFERENCE. IS THE COLOR YOU WERE HOPING FOR NOT LISTED? E-MAIL ME AND WE CAN SEE IF YOUR REQUEST IS DO-ABLE. MORE THAN LIKELY IT IS. THE GRAPHIC IS CENTERED ON THE FRONT CHEST IN BLACK. THIS IS NOT A PHOTO SUBLIMATION OR CHEAP HEAT TRANSFER. OUR SHIRTS ARE SCREEN PRINTED WITH HIGH QUALITY PLASTISOL AND WILL STAND THE TEST OF TIME. THE BACK OF THE SHIRT IS BLANK. 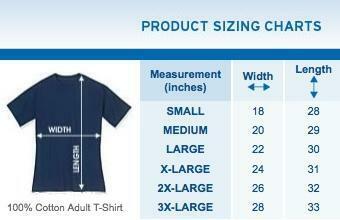 5.4 oz PRE-SHRUNK 100% COTTON / FULLY MACHINE WASHABLE. ALL ORDERS INCLUDE TRACKING INFORMATION DELIVERED VIA E-MAIL WHEN YOUR PACKAGE LEAVES US. IN ALMOST ALL CASES, YOUR SHIRT WILL BE PROCESSED AND SHIPPED WITHIN 3 WEEKDAYS. PACKAGES ARE SHIPPED VIA FIRST CLASS USPS MAIL. INTERNATIONAL RATES DEPEND ON YOUR LOCATION. PLEASE CONFIRM YOUR SHIPPING ADDRESS IS CORRECT BEFORE FINALIZING YOUR ORDER. MY STORE ACCEPTS PAYPAL PAYMENTS. DON'T HAVE A PAYPAL ACCOUNT? NO PROBLEM. YOU CAN STILL USE A CREDIT CARD TO CHECK OUT WITHOUT SIGNING UP FOR ANYTHING. THANK YOU FOR CHECKING US OUT. IF YOU LIKE WHAT YOU SAW, TELL A FRIEND. E-MAIL ME IF YOU HAVE ANY QUESTIONS AND I HOPE WE CAN PRINT FOR YOU SOON.